Orders must be a minimum of $120.00 and within 20 miles of our location to qualify for delivery and pickup. Orders that are outside of 20 miles may require a higher minimum order. We have nominal delivery fees. Island Breeze Party Rentals has the machine that will put a smile on any child or adult's face. Rent our commercial grade soft serve ice cream machine and make your ordinary party into an extraordinary party. Our soft serve ice cream machines make any event a BIG HIT. Whether you want to make vanilla OR chocolate soft serve ice cream, we can take care of it. Our machines work great for root beer floats. Do you want to serve vanilla and chocolate? Then rent two machines and use foam bowls to serve both flavors in one. You can also substitute soft serve ice cream for frozen custard for an additional charge. Frozen custard tastes amazing. 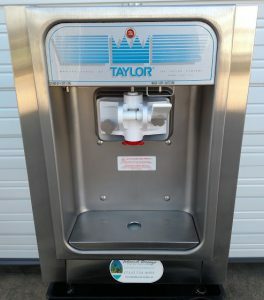 Rent an ice cream machine for your wedding, engagement party, birthday party, bridal shower, quinceanera, corporate event, employee appreciation event, trade show, holiday party, graduation party, or any other special event. Schools, corporations, churches, event planners, catering companies, and individuals rely on Island Breeze Party Rentals to provide clean quality equipment. 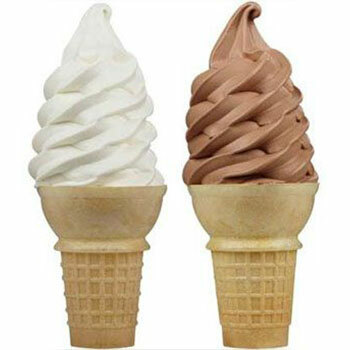 Our soft serve ice machine prices INCLUDE setup and cleaning. We have nominal delivery fees. Pre-arrangement and additional fees are required for deliveries and pickups after normal business hours, non ground floor, or to remote or difficult locations (e.g., large back yards, decks, use of elevator, etc). Disclaimer - We are not responsible for the performance of the ice cream machine if anything other than our ice cream is used. * Please take note that we do not allow our soft serve machines to be transported from the delivery address. We DO NOT carry machines up multiple steps or a flight of stairs. Rent our commercial grade soft serve ice cream machine and serve vanilla or chocolate ice cream just like the major ice cream shops do. We provide our soft serve ice cream machine on a black cart with a black skirt. You just need to provide a regular 120 volt household outlet that is wired to a 20 amp breaker with no other electrical items running on that circuit. Customer is responsible for checking outlet prior to delivery and this machine must be used under a solid shelter if using it outside. Your first cone or bowl will be ready in 5 - 10 minutes and this machine can serve two 4 oz. servings (2-3 cones or bowls) per minute. Rental includes 2.5 gallons of premium dairy VANILLA or CHOCOLATE soft serve mix and this will approximately make 80 4 oz. cones. You also have the choice of 60 cake ice cream cones OR 50 12 oz. foam bowls and 50 white spoons. We Setup and Clean the machine for only $160.00. Upgrade to frozen custard and enjoy a tastier denser, smoother, and creamier desert treat made with egg yolk. Once you taste frozen custard you will never want anything less. Upgrade to frozen custard for only $25.00 more. 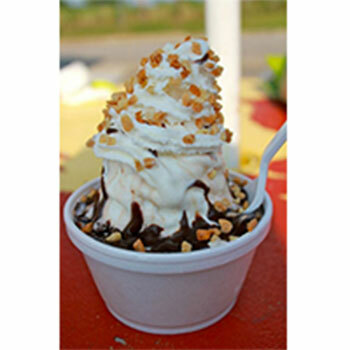 Purchase an extra 2.5 gallons of vanilla soft serve mix for $40.00 each. Purchase an extra 2.5 gallons of Annie's Original 10% Custard mix (vanilla or chocolate) $65.00 each. Purchase an extra 20 cake ice cream cones for $4.00. Add 12 oz. foam bowls to your order to easily add toppings to your ice cream. Purchase an extra 50 foam bowls and spoons for $8.00.